Watching the Kansas City Chiefs offense will now come with a legal warning about personal injury risk. The NFL will not be held responsible for any neck injuries, and it's recommended viewers both live and at home wear braces at all times. That was already true to some extent with the Road Runner-like ways of wide receiver Tyreek Hill and running back Kareem Hunt. Travis Kelce is also unfairly fast for a 6'5" and 260-pound tight end, as Next Gen Stats have shown us in the past. 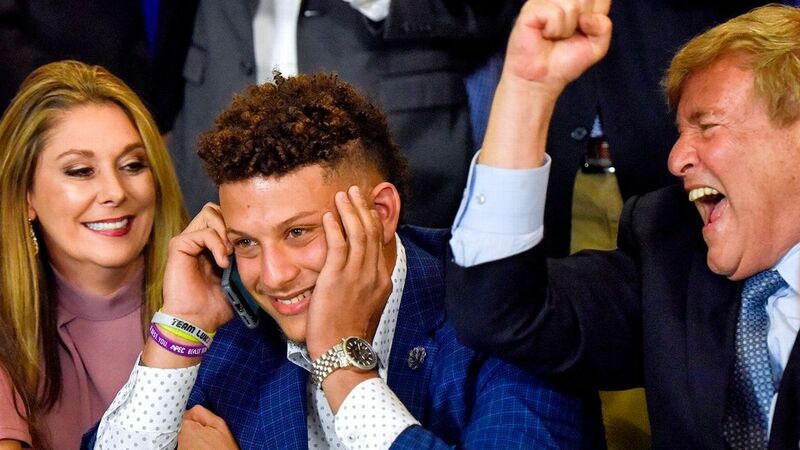 And Patrick Mahomes, the Chiefs' new quarterback and their first-round pick in 2017, scored 22 rushing touchdowns over his final two years at Texas Tech. Now Kansas City has added even more nitro fuel after giving its promising but inexperienced passer another deep option by agreeing to a deal in principle with Sammy Watkins on Tuesday. Watkins was the best wide receiver available in free agency not named Allen Robinson. When Robinson was snatched up by the Chicago Bears earlier Tuesday morning, per NFL Network's Ian Rapoport, the Chiefs turned their attention to Watkins, who will be entering only his age-25 season in 2018. Like all agreements during the legal tampering period (see: the unofficial start of free agency), no formal contract can be in place until 4 p.m. ET on Wednesday. But, also like most agreements prior to Wednesday, this one has been reported by multiple sources, including ESPN's Adam Schefter, and will be finalized barring something bizarre. When Watkins officially puts ink to paper, he'll elevate an offense that was already quite terrifying for defensive coordinators, especially after the addition of Hunt. The Chiefs went from having a safe, often methodical offense to one that bombarded opposing secondaries. They averaged 7.2 passing yards per attempt and 233.8 per game in 2016, and that production spiked to 8.0 and 256.5 last season. Now the ceiling for a team rooted in quick striking is even higher because of Watkins' youth and proven production. Watkins has somehow been around for only four NFL seasons, the most recent of which was a step back, at least in terms of his overall yardage. He finished with only 593 receiving yards for the Los Angeles Rams, his lowest single-season total during a year in which Watkins played at least 13 games. However, although Watkins still shoulders some blame, he was a victim of poor circumstances. The Buffalo Bills traded him to the Rams in mid-August, which didn't give him much time to get comfortable in a new offense. Other receivers who had been learning head coach Sean McVay's playbook throughout the offseason benefited from their head start. As a result, Watkins finished fourth on the team in targets with 70, well behind the 94 given to fellow wide receiver Cooper Kupp. Watkins averaged a career-low 4.7 targets per game in 2017, but that didn't stop him from being a consistent scoring threat. He had eight receiving touchdowns, tied for eighth-most in the league with 10 other pass-catchers, all of whom needed 50-plus receptions to reach that mark. Watkins, meanwhile, finished with just 39 catches. He's always managed to find the end zone frequently, logging 25 career touchdowns over just 52 regular-season games. Even more impressively, 13 of those scores have come from 20-plus yards, as Rotoworld noted, which shows his explosiveness from anywhere on the field. The year he spent in Los Angeles stands out for another reason too. He took a small but significant baby step forward in his health, playing a full season for the first time since his rookie year (the team rested him during a meaningless Week 17 game). Injuries were one of the giant red flags on Watkins after he missed 11 games over the 2015 and 2016 seasons because of a troublesome foot problem. If he were older, injury concerns would have torpedoed his value. Watkins has plenty of prime years left, however, and he has seemingly put a recurring injury behind him. There is still some risk for the Chiefs, though, because it's difficult for a general manager to sleep soundly after giving $30 million guaranteed to a player who has been sidelined so often. The jitters could get worse whenever the Chiefs look at Watkins' new contract and remember he's now the NFL's fourth-highest-paid receiver at an average annual value of $16 million, per Spotrac. But that's a risk the Chiefs can easily stomach. Because of several cap-saving moves prior to free agency (including cutting defensive end Tamba Hali), Kansas City is in the black by $27.2 million even after signing Watkins, per Spotrac. Hearing from multiple folks around the league who are intrigued by what the Chiefs are building on offense with Pat, Kareem, Kelce, Ty and Sammy. "So nasty," one person said. Watkins joins an offense powered in 2017 by Hunt, the league's rushing leader with 1,327 yards at an average of 4.9 per carry. Hunt also showed his versatility with 53 catches for 455 yards, bringing the 22-year-old's total to 1,782 yards from scrimmage as a rookie. Then there's Hill, one of the Chiefs' four core offensive skill players at or below the age of 25 to start the 2018 season. Hill is an all-purpose dynamo who launched his career with 20 total touchdowns (13 receiving, three rushing and four returning) over only two seasons. The 2017 campaign was his first as the Chiefs' No. 1 receiver, and he responded to that spotlight with 1,183 receiving yards at an average of 15.8 yards per catch. The speed, acrobatic catches in traffic and easy separation will keep coming through Kelce, who recorded his second straight 1,000-plus-yard season in 2017, and wide receiver Chris Conley. The home run specialist from Georgia needed only 4.35 seconds to run the 40-yard dash at the 2015 NFL Scouting Combine. Not long ago, the Chiefs' identity centered around defense. That focus has shifted over the course of three offseasons with the additions of Hill, Hunt and Watkins. And best of all, Mahomes, the bazooka-armed quarterback who gets creative with his legs too, is the one who gets to light the fuse.